Every one of us has a story we can share. Think of a past event in your life related to GBMC. Whether it’s care you received, an opportunity you have, or a loved one you remember, this event should have very personal meaning to you. What’s happened in your life since your experience at GBMC? Read Sean Squires’ story below, and share yours at www.gbmc50.com/mystory. Sean Squires' Story: "Finding My Niche"
A few years ago, my grandfather was admitted to the Gilchrist Center in Towson. He was diagnosed with stage 4 lung cancer that had metastasized to other parts of his body. The doctors said he would have six months or less to live, but the time frame became less and less as time went on. In a matter of eleven days from his diagnosis, my grandfather was taken away from my family, this world and myself. 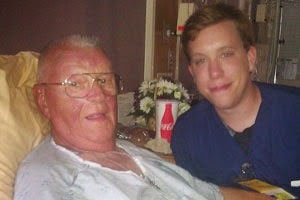 After his diagnosis, most of my grandfather’s time was spent between the hospital and Gilchrist Hospice Care. The staff at Gilchrist took exceptional care of my grandfather while he was under their watch. They came in to check on him, and us, every hour on the hour. Staff members came in with smiles on their faces and brightened up the room, even when the days seemed gloomy. Not a moment went by that I was displeased with the care Gilchrist provided. Death is always a saddening event. We fear for our loved ones, we fear for our own lives without them and, most of all, we fear for that empty place in our hearts that will never be filled again once they are gone. The staff at Gilchrist made our journey through death easier. Every time I think of what they did for my grandfather, I will be forever grateful. My mom was working in the finance department for Gilchrist at the time of my grandfather's arrival to the Towson inpatient unit. After my grandfather passed, I spent days thinking and hoping his death was all a dream. Then one day it hit me: I decided I wanted to give back to hospice because of the amazing care they provided for my grandfather. I knew it would be rough, especially with the recent loss of my grandfather, but I knew I wanted to be the one helping other families through this rough journey. With help from my mom and through contacting a few people, I was hired as a Certified Nursing Assistant for Gilchrist Hospice Care. To this day, receiving that job was one of the most rewarding and amazing experiences I have ever had. Without Gilchrist, I would not have grown to be the person I am today. It changed my outlook on life, taught me what the priorities in life are and trained me on how to nurture and show compassion to the utmost. It is so rewarding to be there for someone's first breath into the world, and equally rewarding to experience his or her last breath as they leave this world. Without Gilchrist I would not be on the journey I am on today. I know now, after working for hospice, that it is definitely my passion and drive. I am currently enrolled in nursing school, looking forward to graduation and beginning my new journey as a Registered Nurse providing hospice care. I am elated and proud that I have found my niche and something that is very near and dear to my heart. Without Gilchrist I would not have been able to experience the changes I went through as a person, wouldn’t have seen the amazing things I saw or have been able to create such rewarding bonds with such amazing staff members at Gilchrist Hospice Care. Schedule Your Child's School Physical Today! As the weather gets warmer and summer approaches, it is easy to get excited about upcoming vacations, trips to the beach or pool, Orioles games and plenty of other fun summer activities. With all of those thrilling events on the horizon, getting a school physical is one thing that might get pushed to the back burner. If you or your friends and loved ones have kids, it is important to know that many summer camps, athletic programs and nearly all schools require that children between the ages of four and 17 have annual physicals. Before this important item gets forgotten in the rush of summer fun, and before the end-of-summer sneaks up on you, schedule your child’s annual checkup today. Let us help with checking that item off your “to-do” list before camp and school registrations are due. If it has been a year since your child’s last checkup, visit www.mygbmcdoctor.com/todolist to request a physical for him or her. A GBMC team member will call you back within 1 business day to schedule an appointment. If you need to select a new primary care physician for you or your child, call 443-849-GBMC (4262) or visit www.mygbmcdoctor.com. 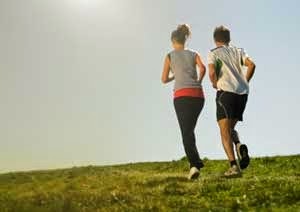 In the first month of our Couch to 5K training plan, you got up and moving in intervals of brisk walking and light jogging to help build your cardiovascular base. If you’re just joining us now and missed last month’s installment, please read and complete Tips for Starting Out before jumping into the plan listed below. As always, check with your primary care physician before beginning any exercise plan. At least once per week, perform some sort of exercise that is not running. This can be anything that gets you up and moving, including swimming, elliptical training, cardio kickboxing, Pilates, yoga or other exercises (see a list of ideas for different exercise types and descriptions of each in our article Exercises for a Fitter New Year). This is cross-training, something that continues to work your muscles and build your fitness base without focusing on the same exact movements as running. Remember to keep track of how far you’re able to go now that you are running for longer intervals! You should be able to notice whether you’re going farther, moving faster or generally feeling better. Keeping track of this will help you see where you are improving. Good luck this month, and stay tuned for Month 3 training coming in May! Healthy eating and lifestyle trends are constantly making the news, providing an ever-increasing list of “super foods” claiming to be important to health. With so many new studies promoting different foods and supplements on a daily basis, it can be difficult to know which offer potentially beneficial properties. 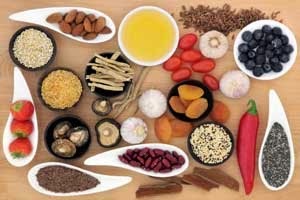 This list of seven super foods may help shed light on the uses of a few of these possibly powerful dietary items. It's important to note that moderation is key when it comes to many foods. Before making significant changes to your diet, consider consulting with a physician or dietitian. Açai berries (pronounced “ah-SIGH-ee”) – Açai berries are small purple berries purported to aid in weight loss and anti-aging. Açai berries contain high levels of antioxidants, which may help to fight cancer and heart disease. The berries also contain oleic acid, a heart-healthy fat that is also found in olive oil. Consume açai berries in smoothies, juices or as part of a dried fruit trail mix. Cacao powder (pronounced “cah-cow”) – Cacao powder contains flavonoids, which may lower blood pressure and improve blood flow to the brain and heart. It is important to source a product that has not been processed, because once processed, cacao powder loses up to 90 percent of its antioxidants. Add cacao powder to smoothies or baking recipes. Chia seeds (pronounced “chee-ah”) – Chia seeds are nutrient-rich and known for their high omega-3 fatty acid, fiber and calcium levels. They produce a crunch when chewed, have a nutty flavor and can be easily added to oatmeal, smoothies, salads or a glass of water with a lemon wedge. Goji berries (pronounced “go-gee”) – Goji berries contain high amounts of vitamin C and antioxidants. Though science has not yet backed the claims, Chinese herbalists say that these berries help with vision problems, poor circulation and boosting the immune system. Eat dried goji berries as a snack or add them to smoothies and juices. Hemp seeds (pronounced “heh-mp”) – Hemp seeds are high in protein and contain all of the essential amino acids your body needs for growth and repair. They are also high in omega-6 and omega-3 fatty acids, and are a good source of magnesium and potassium. Also of note, they contain no trace of the psychoactive ingredients found in marijuana, so there is no need to worry. Add hemp seeds to smoothies, granola, baking, juices and more. Kale (pronounced “kay-el”) – Kale leaves contain phytonutrients that are said to help lessen the occurrence of a variety of cancers including breast and ovarian. Add kale leaves to salads, juices, smoothies and sandwiches, or bake them to create kale chips. Quinoa (pronounced “keen-wah”) – Quinoa is a grain that is high in protein and fiber and a natural source of iron, zinc, vitamin E and selenium. These nutrients contribute to claims that consuming quinoa helps with weight control and lowering your risk for heart disease and diabetes. 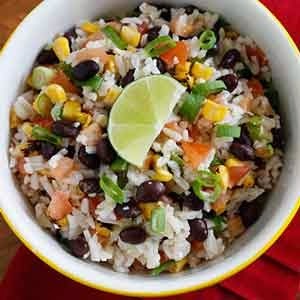 It can be eaten like rice as a side dish with a meal, mixed with vegetables and proteins to create a main dish, or baked in a variety of ways.